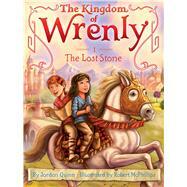 Welcome to the Kingdom of Wrenly—a new chapter book series full of fantasy and adventure. Meet Lucas, the eight year-old prince, and Clara, the daughter of the queen’s seamstress. Lucas is an only child who longs to make friends and go on adventures. Clara knows the kingdom well, so she and Lucas team up and explore the lands of Wrenly! In The Lost Stone, Lucas and Clara search for Queen Tasha’s missing emerald. On their exciting adventure, they travel to all the main attractions of Wrenly: Primlox (the island of fairies), Burth (the island of trolls), Crestwood (the island of dragons), Hobsgrove (the island of wizards), and the beautiful Mermaid’s Cove. King Caleb has promised to reward the person who finds the precious stone, and Lucas and Clara are determined to search the entire kingdom until they find it!